William Haigh was born on the 18th May 1894, the illegitimate son of Mary Haigh of Flushdyke. He was baptised at Ossett Holy Trinity Church on the 5th September 1894. In Spring 1897, Mary Haigh married Arthur Hudson and they lived at Nooking Yard, South Parade, Ossett. It has not been possible to locate William in the 1901 or 1911 Census, but at some stage before he embarked for France he lodged at the Prospect Road, Ossett home of George and Martha Howden, who formerly lived at Flushdyke. William Haigh’s army service record has not survived, but it is known that he enlisted at Wakefield, and was one of the first Ossett men to embark for France on the 9th September 1914 with the 2nd Battalion of KOYLI. The 2nd Battalion of KOYLI was a regular army battalion and in August 1914 was based in Dublin as part of the 13th Brigade in 5th Division. On the 16th August 1914, the Battalion landed at Le Havre and on the 28th December 1915 the battalion transferred to 97th Brigade in 32nd Division. 2nd Battalion, KOYLI had been in France with 13th Brigade, 5th Division, since August 1914, participating in Mons and the subsequent retreat, Battle of the Marne, Battle of the Aisne, the La Basee front, moving north to participate in the First Battle of Ypres. At the beginning of April 1915, the Division moved from Wulverghem to the southern part of the Ypres salient, taking over the line from the east of the mound at St. Eloi by the Bluff, Hill 60, and Zwartelen to the western edge of Armagh Wood. Private Haigh was in trenches in early April 1915 and there was no specific action ongoing at the time. It is likely that he died as a result of shelling or participating in a trench raid. "Ossett Lad Killed In The War - News has been received this week by the relatives of an Ossett soldier, Private William Haigh, of his death at the front. The official notification received from the War Office states that he was killed in action on April 5th (Easter Monday) at Verbranden Molen, which is a village in Belgium, two or three miles south of Ypres. 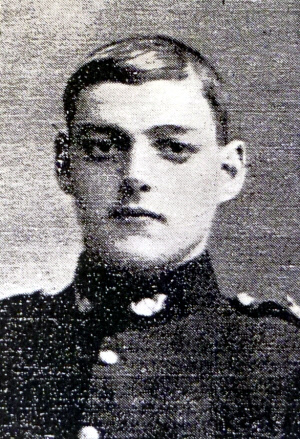 Private Haigh, who was not yet quite 21 years of age, was in the special reserves when the war broke out, and had been called up for the annual training when the war broke out. He was then transferred to the 2nd King's Own Yorkshire Light Infantry, and went to the front with the first contingent in September last year. He had thus been through six months of the war, without so far as is known receiving any injury, before being called upon to sacrifice his life for his country. The deceased soldier lodged at the house of Mrs. G. Howden, 38, Prospect-road, and was a surface worker at Old Roundwood Colliery. Mrs. Howden received from him a postcard that he was well, dated the day before he was killed." William Haigh was posthumously awarded the British and Victory medals. He was also awarded he was also awarded the 1914 Star with clasp to recognise his service overseas between the outbreak of the War and the 22nd November 1914. The narrow horizontal bronze clasp sewn onto the ribbon, bearing the dates 5th Aug - 22nd Nov 1914 shows that the recipient had actually served under fire of the enemy during that period. Recipients of the 1914 Star were responsible for assisting the French to hold back the German army while new recruits could be trained and equipped. Collectively, they fully deserve a great deal of honour for their part in the first sixteen weeks of the Great War. This included the battle of Mons, the retreat to the Seine, the battles of Le Cateau, the Marne, the Aisne and the first battle of Ypres. There were approximately 378,000 1914 Stars issued. Private William Haigh was killed in action on the 5th April 1915, aged 20 years, the son of Mrs. Arthur Hudson. He is remembered on Panel 47 at the Ypres (Menin Gate) Memorial,2 Ieper, West-Vlaanderen, Belgium. Ypres (now Ieper) is a town in the Province of West Flanders. The Memorial is situated at the eastern side of the town on the road to Menin (Menen) and Courtrai (Kortrijk).